As per the USDA's Food Guide Pyramid, we should be targeting 2-4 servings of fruit and 3-5 servings of vegetables daily. However, seldom do we find any mention of the type of those fruits and vegetables. Do the different colors in these items matter, or are they only decorative in nature? (1) The fact of the matter is that the various nutrients in these food items, give them their characteristic color. So, let us analyze what these different colors in the various Fruits and vegetables indicate. Yellow and Orange fruits and vegetables get their color from lutein and zeaxanthin, carotenoids. These also contain antioxidants like Vitamin A and C. Oranges, mangoes, yellow peppers, lemons, pineapples, pumpkin have good quantities of these beneficial substances. 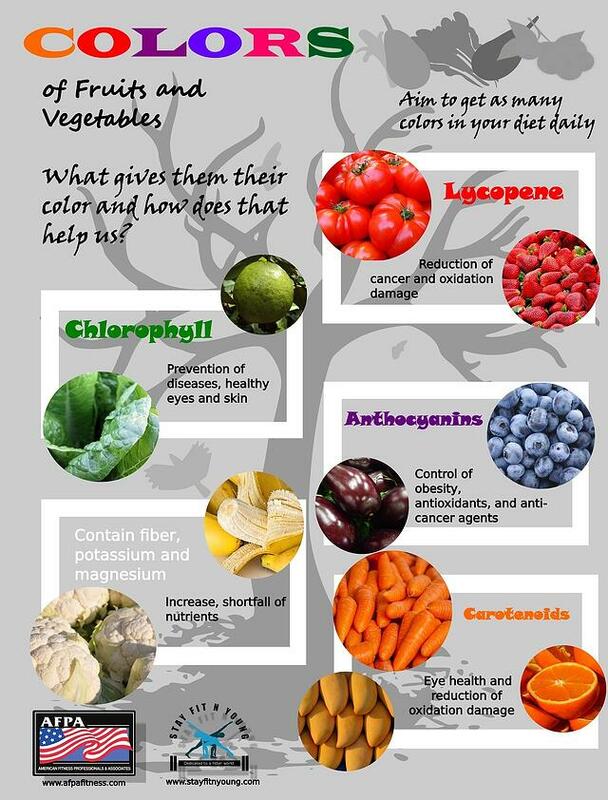 Fruits and vegetables have their distinctive color due to presence of Phytochemical of varied nature. Various nutrients are present in different quantities in various foods. You should ensure that your daily diet compromises of as many colored fruits and vegetables to get a combination of the health effects.